Family caregivers truly are the backbone of Ohio’s long-term care system. Approximately 1.7 million Ohioans provide some level of unpaid care for a loved one who is older or who has a disability. Caregivers are spouses, children, grandchildren, grandparents, brothers, sisters, aunts, uncles, friends, neighbors and more. Caregiving is unique to every family and every relationship. 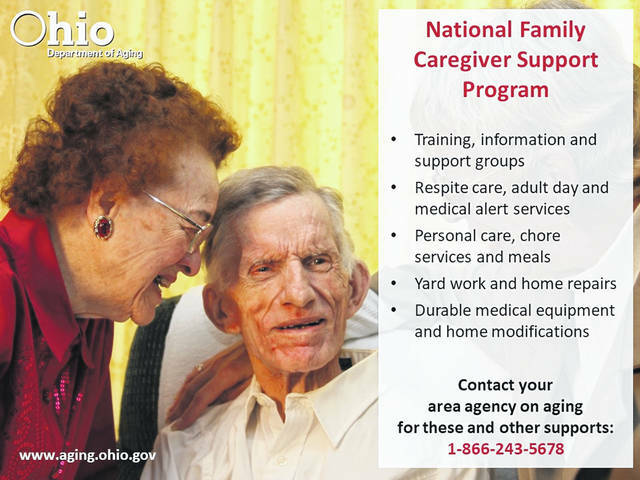 Ohio’s area agencies on aging, through the National Family Caregiver Support program, provide an array of supports for family caregivers, including training, respite care, medical alert services, personal care, home delivered meals, chore services, home modifications and more. Call 1-866-243-5678 to be connected to the agency serving your community. • Mary and Lee have been married for more than 67 years and have lived in their Hamilton County home for nearly five decades. When Lee was diagnosed with dementia and Parkinson’s disease, Mary called the Council on Aging of Southwestern Ohio and enrolled Lee in the Elderly Services Program. His son and daughter drove him to an adult day program twice a week, giving Mary some respite. However, her daily duties coupled with difficulty sleeping due to Lee’s nighttime needs led Mary to feel overwhelmed and exhausted, so their care manager referred Mary to the Council on Aging’s caregiver support program. Their, a support nurse, Anna, visits with Mary and regularly reassures her. Anna also advocated for a third day of adult day services, with the goal of keeping Lee at home with his wife for as long as possible. • Gloria had a stroke a few years ago, which affected her memory and caused dementia. Since her stroke, her husband, William, has been her primary caregiver. During Gloria’s rehabilitation, hospital staff referred William to the Central Ohio Area Agency on Aging, where he learned about available services and resources that could help Gloria. With help of COAAA and the PASSPORT program, Gloria attends adult day services twice a week, giving William respite from the busy schedule of caregiving, and allows him to refresh his energy, go grocery shopping and go to doctor’s appointments while knowing that Gloria is in a safe place. William has great family support, as well. His son helps him on the weekends. • Sara was a fifty-something mother of two adult children looking forward to early retirement when her out-of-state parents’ health started declining. Her parents, Mary and Ken, lived four hours away in another state, and Ken was the only driver of the two. Once he lost the use of his legs, he was unable to drive at all and this left the couple with no access to the outside world. They chose to relocate to Ohio so that they could be closer to Sara for support. Sara received help from the Family Caregiver Support Program at Direction Home Aging and Disabilities. Staff there conducted an assessment and helped to create a care plan for her parents. They also linked Sara to classes to help her stay organized as she planned for future care needs, as well as respite services when her father passed away and her mother needed more care due to Alzheimer’s Disease. Sara was able to continue working, keep her parents in the community and spend quality time with her husband and children thanks to the assistance she received from her area agency. • Linda and her family have lived in Jefferson County all their lives. When Linda’s husband Wayne was diagnosed with Alzheimer’s disease, she reached out to Area Agency on Aging Region 9, Inc. and was linked to their Caregiver Support Program. Linda was suffering stress and burnout. She was desperate for ideas on how to deal with his behaviors and find respite. The area agency enrolled Wayne in Care Coordination services to give Linda a break. They taught Linda how to respond to difficult behaviors and addressed her need for self-care. Her caregiver support nurse made regular calls and visits, and Linda attended the monthly facilitated support group. Linda was supported even as Wayne moved from their home into a nursing home. Linda now is caring for her 97-year-old mother. She still attends the monthly support group. She is grateful for the area agency’s caring hand that has assisted her through her caregiving journey. • Linda is a 55-year-old grandparent caregiver living in Gallia County. For the past 12 years, she has raised her three young grandchildren. Linda became involved with the Area Agency on Aging District 7, Inc. Caregiver Support Program after a counselor for one of the grandchildren referred her. Linda lives in a small home with no stove and had been cooking all their meals in a microwave oven. Following a home visit, area agency staff linked Linda to supplemental services in the Caregiver Support Program and the Help Fund (a support program funded by donations from area agency staff), and helped Linda get a new stove. The first real meal Linda fixed for her family on the new stove was pot roast. Linda related, “It is nice knowing there is someone out there that understands what grandparents raising grandchildren are going through.” Linda continues to receive support from the area agency, including a monthly newsletter with information and education resources. We are incredibly proud of our area agencies on aging and the work they do every day to help older adults and their families live healthy lives and stay connected to their communities. Submitted by the Ohio Department of Aging.